With Leeds having beaten Yeovil 1-0 on the Friday night before, Brighton’s slim hopes of making the play-offs had gone. Due to the expected high volume of away fans, I had already got my ticket. Had I not, I may have been in two minds about going. However, it was the last ever game at the Memorial Stadium, before its complete redevelopment, so I’m glad I finally got to see it. Also, it was nice to be able to see the Albion’s last away game of what I believe has been an excellent season for Dean Wilkins and the squad. I had been without my fine pair of Bristols since the Rovers moved from Bath’s Twerton Park in 1996. In 12 years, like Kenilworth Road that I visited two weeks ago, it was a ground that had managed to elude me. Conincidentally, the distance between my house and Kenilworth Road and my house and the Memorial Stadium are exactly the same – 131miles. This time I was driving though, after my nightmare train-bus fiasco to Luton which cost a small fortune. My Punto turned out to be much more reliable, although it has developed a road safety conscience of its own, rattling alarmingly at speeds over 70. 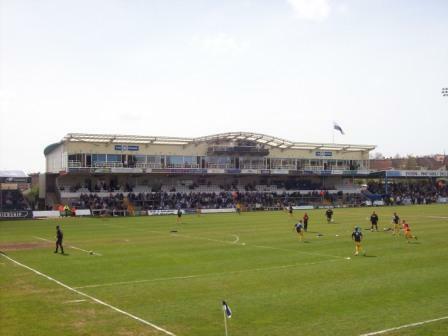 In the 1990s my favourite football fact was that Bristol Rovers and Plymouth had spent their entire league existence in divisions two and three. I was disappointed when first Plymouth(94/5) and then Bristol Rovers(00/01) got themselves relegated to the bottom division for the first time, thus killing a cracking quiz question. Although technically, when they went down, it was still division three because the Premiership had re-numbered them. This was the second Brighton away win I’d seen in two weeks. This was my best viewing form since 1991, when I saw back to back Brighton wins at first Swindon (3-1) and then, coincidentally, Bristol Rovers, the Saturday after, with another 3-1 win. That one was at Twerton Park. 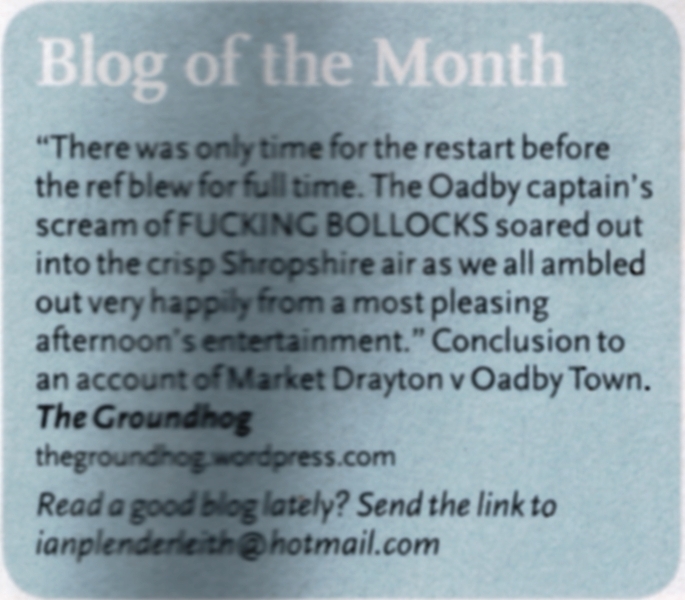 This was in my favourite Albion season ever which included 9 away wins, a play-off final, and goals galore. I liked Twerton Park in all its makeshift non-league glory. There was a good atmosphere in the tight away pen behind the goal. The Memorial Stadium is even better, though. Nestled snugly in amongst terraced houses in Horfield, in the north of Bristol, it has a very traditional feel to it with high floodlight pylons and many different stands. 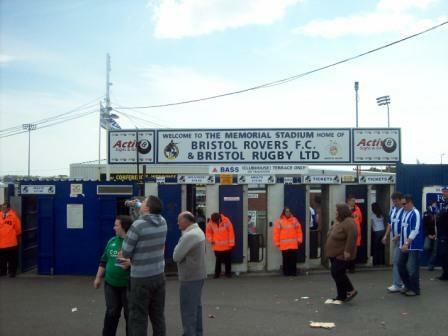 It is the ground of Bristol Rugby club foremost, but the Pirates have shared it for 12 years now. They moved back into their home town after having spent 10 years sharing with Bath City at Twerton Park. 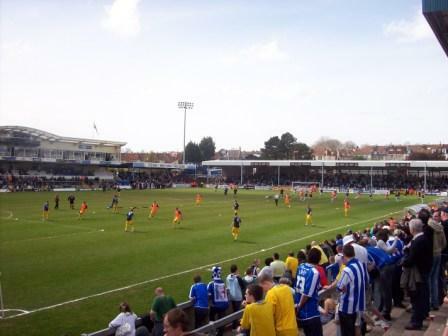 Bristol Rovers were founded in 1883 as the Black Arabs. They changed their name to Eastville Rovers and then Bristol Eastville Rovers before finally settling on Bristol Rovers in 1899. They played at the Eastville Stadium from 1897 to 1986. I’m disappointed at not having gone to the Eastville. I remember seeing it from the M32, just after they stopped playing there, and thinking that it looked like a ground with lots of character. The proximity of this ground to a large gas works is why Rovers fans are more commonly referred to as gasheads than pirates, and the team as just The Gas. Originally it was a derogatory term coined by Bristol City fans, but the Rovers fans took it on in the 80s, and it has stuck to this day. I parked in Filton Avenue and incidentally, for the first time ever before a football match, got my hair cut! It wasn’t planned, there just happened to be an empty barbers opposite where I parked, after a journey spent looking in the rear view mirror at my huge Melvyn Bragg hair. The barber joked on finding out I supported Brighton that he was going to shave my hair into quarters like the Rovers famous kit! Walking along the roads near the ground gives you some tantalising views of the stadium. The little bit of corner terracing you can just make out next to the big stand, is the away terrace. Unfortunately, it wasn’t just a case of walking up that road to the turnstile. One had to make a very circuitous route round the ground to find the away entrance. 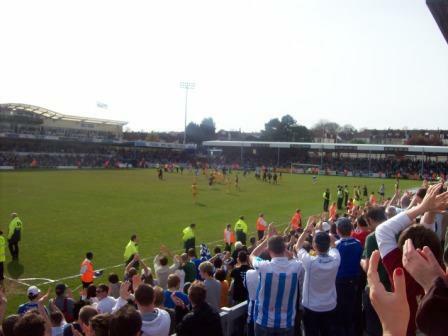 This didn’t turn out too bad, though, as it was a lovely sunny day and there was a great atmosphere outside the ground. 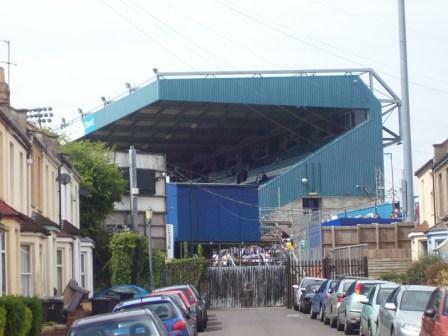 There are two big stands at the Mem, the one next to where us away fans were, which I couldn’t get a good picture of due to the close proximity and one opposite which was a really unusual stand, reminding me more of a cricket pavillion than a football stand. Two smaller covered stands sat next to this. To the left was a tarpaulin covered seated stand, where an allocation of 290 seats were given to the Albion fans,next to the terrace. A fair-sized behind-the-goal terrace was opposite the other end, where gasheads were packed in, and where most of the home singing came from. It is a great ground, one of the sort I really like, with disparate structures dotted about round the edge; stands and terraces that have evolved over time into a ground developed all the way round, into a whole that was both interesting architecturally, pleasing to the eye and able to create a good atmosphere. It is such a shame, in a way, that it is soon to be demolished and rebuilt from scratch with the pitch changing aspect by 90 degrees. It will be just another new stadium then; modern, smart, comfortable, great views but without character. At least it will still be nestled among terraced streets and not out of town. The match turned out good in the end, despite an offensively bad first half, where both teams played awful, with Brighton hoofing it at every opportunity, seemingly to no-one in particular. It really did smack of neither side caring as there was nothing resting on it. But Brighton came out with purpose in the second half and scored two good goals in three minutes to get another deserved three points on the road. A final point is that the Cornish Pasties were to die for. It is very rare indeed that I partake of stadium fodder, but I hadn’t had any lunch so was forced to submit. Even at £2.50,which before eating, made me wince, it was an absolute bargain. Maybe it is the proximity to Cornwall, I don’t know, but it was the best stadium food I’ve ever had. Glad you enjoyed the Cornish Pasty – I was there in 2001 and had the same delightful experience. Was the match programme really £3.50? Only Birmingham City and West Ham United from the Premiership have hit that level so far – I suspect other will now follow. At least you still visit barbers – this Pieman stopped many years back! The pasty was amazing – if they can keep the same supplier for the new Memorial then it’ll be worth going back. Shame the redevelopment never went ahead. The away end could really do with a roof its the only part of the ground without one. I think their programme is now £3 and seems to win an award every season. Oh and Im told by a gashead mate that their Cornish Pasties are made in Cornwall the day before a game.